Wedding PR: Gay Weddings, Huffington Post, and more! We hope everyone is ready for another great client feature round-up including Gay Weddings, Huffington Post and much more! See it all below. 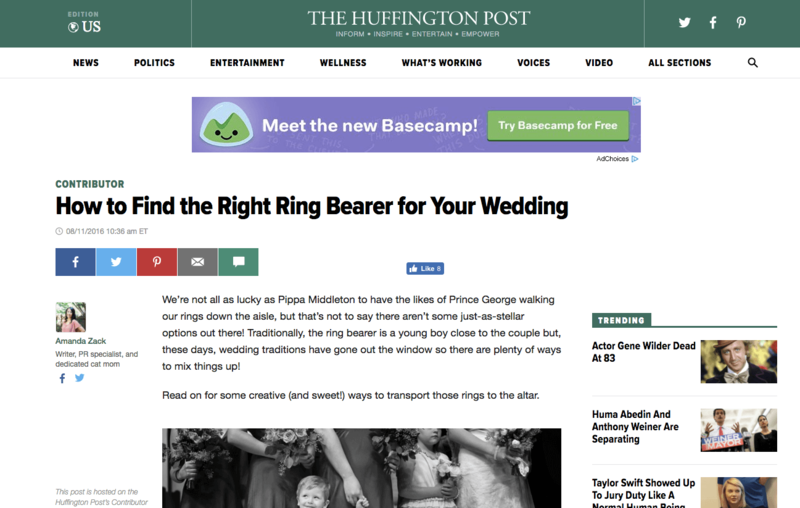 Taylor’d Events, Don Mears Photography, Rochelle Cheever Photography and Mike B Photography were featured in the Huffington Post article How to Find the Right Ring Bearer for Your Wedding. See the full feature here. OFD Consulting was featured on TISOH with the guest article Top Considerations Before Taking the Press Plunge. See the full article here. Fantasy Sound Event Services was featured on Special Events with the guest article An Event Insider’s Look at Company Culture. See the full article here. Gay Destination Weddings was featured on Gay Weddings in the article The 3 Hottest LGBTQ Destination Wedding Trends. See the full feature here. OFD Consulting was featured on Timeline Genius with a guest blog Wedding PR: Tips and Tricks for Getting Published that included Destination Weddings, 100 Candles, and Magdalene Photography. See the full feature here. Don Mears Photography was featured on Jet Fete with a destination wedding in Puerto Rico. See the full feature here. Taylor’d Events, Destination Weddings, and Rochelle Cheever Photography were featured on Huffington Post in the article How to Elope the Right Way. See the full feature here. 100 Candles was featured on Catersource with a guest blog Candle Clusters: The Ultimate Statement Piece. See the full article here. Cocoon Events Group Management was featured on Huffington Post in the article The Destination You Never Considered for Saying ‘I Do.’ See the full feature here. Destination Weddings was featured on Special Events with the guest article 2016 Destination Wedding Trends. See the full article here.